This post was originally published on 8/24/2014. Due to its popularity, it was updated with new information on 3/14/2018. If you’ve found this blog, chances are you’re researching the process for buying a modified shipping container. It’s a significant question and one that we hear daily. Aside from our ready to go fleet of leasable assets and standardized product line, Kinetic Series, everything we do is custom. Even then, our rental assets usually require some form of personalization like vinyl branding or banners. To give you the best possible answer, we’ll need to ask you some other questions first. Size/Number of Containers– This is important for designing for traffic flow and occupancy levels. Functionality– Are you exhibiting indoors or cooking a gourmet meal in the tundra? For exhibiting indoors, you won’t likely require the same expensive coding, design, and approval process as a commercial kitchen. Aesthetic– When you think of shipping containers, corrugated siding (the wavy metal part) is probably the first image that pops into your mind. But for us, that’s just the start. We can finish a container with nearly any siding you can imagine. So, the look you’re going for, be it ultra modern, industrial, or rustic will play into the final cost of your overall project. How quickly do you need your space built? We run a job shop. That means that our manufacturing process is not like Coca-Cola or Johnson and Johnson, who crank out millions of units without blinking an eye. The bespoke nature of our work means that each stage of the build is different based on our clients’ needs. On the other hand, we are still a manufacturing facility, so we can produce buildings at a much faster rate than traditional construction methods. We tell our clients that on average a project will require approximately 50 business days, from a signed contract, not including delivery. This timeframe isn’t exact but allows for some flexibility in balancing our client’s obligations. If you need the structure delivered in a shorter timeframe, you may incur expediting fees. So, if the price is as important to you as the delivery date, we highly recommend entering a build contract with us as soon as possible. What level of finishes will we use? The answer to this question will have the largest impact on your price. Structural elements of the unit(s) can be pricier than the aforementioned YouTubers might lead you to believe, but they are absolutely essential to the integrity of the structure. It’s tough to affect these costs in our value-engineering process. However, the elements that DRASTICALLY increase the price of any building are the finishes you choose. Are you using Italian marble countertops with stainless appliances or are you utilizing ACM paneling and vinyl decking? If you aren’t sure what you can afford, fear not! When you’re forthcoming with your budget, we can use it to help guide you through materials and designs that will fit within those constraints. 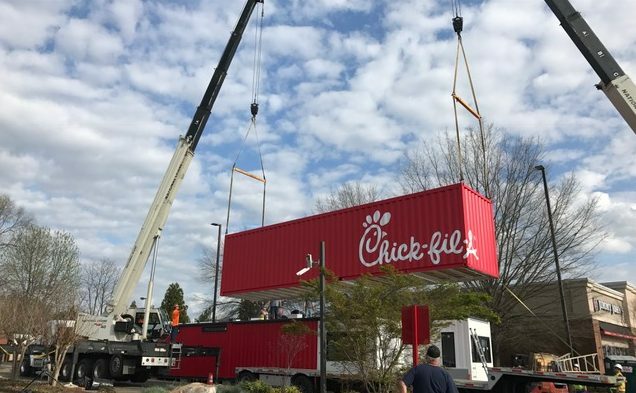 Where will the containers be located? Aside from having an in-house design and manufacturing team, we also maintain our own fleet of trucks. Which means we can deliver one-off activations or move the event around the country. Our facility is in Charlotte, NC. So, every delivery starts in Charlotte. The farther you are away, the more expensive logistics fees will be. However, these costs are a small fraction of your overall budget. Where we really see cost savings (or significant cost increases) in logistics is the equipment we need to unload and install the container. Hiring a barge to swing a container onto a pier will be more expensive than a forklift, which is more expensive to rent than a self-offloading trailer. Sometimes these costs can be avoided. Sometimes they can’t. Fortunately, our logistics team is experienced in negotiating vendor pricing and finding innovative ways to help you through the budgeting for delivery and installation costs. If you have any additional questions about our pricing, or if you would like a quote, please feel free to reach out to us through our contact page!